Define location of your original folder by selecting it in the menu. Then, to choose a location where your files will be backed up, select a storage folder. Original folder: Shows the path to your original folder. Press the small button with folder icon on the right of "Select original folder" field and select the folder you want to backup. A new page "Browse for folder" will be displayed. Here you can select original directory with your important files. Storage folder: Shows the path to your storage folder. Local: If you want to store your backup files locally (on your computer, any removable media or on the LAN) you should press the small icon on the right of the "Local" radio button. A new page "Browse for folder" where you can select a directory to store your files locally will be displayed. Host to connect: Enter the server name or IP-address of the FTP server you want to transfer files to, e.g. ftp.yourftpserver.com. Port: Enter the port number. In most cases its default value is 21. Initial remote path: Shows initial remote path to your destination folder. User: Enter your user name for the host computer. Password: Enter your password for the host computer. Passive mode: In passive mode your computer establishes the connection. This may be necessary through some firewalls, which do not allow connections from outside. Show from home: Shows your directory on the remote host from user home catalog. Case sensitive: Switches you to a case sensitive mode. Proxy Configuration button: Proxy Server settings dialog will be displayed. Connect button: Press the button to start the connection. Progress bar: Displays the progress bar visualizing connecting process. Connection Log window: Shows reports on work performed. 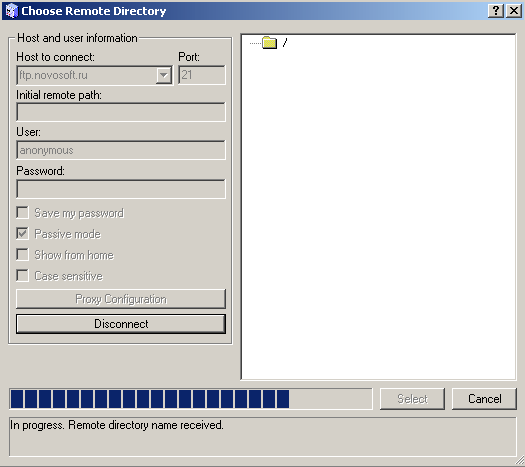 clicking the desired directory in the directory list box and pressing "Select" button.